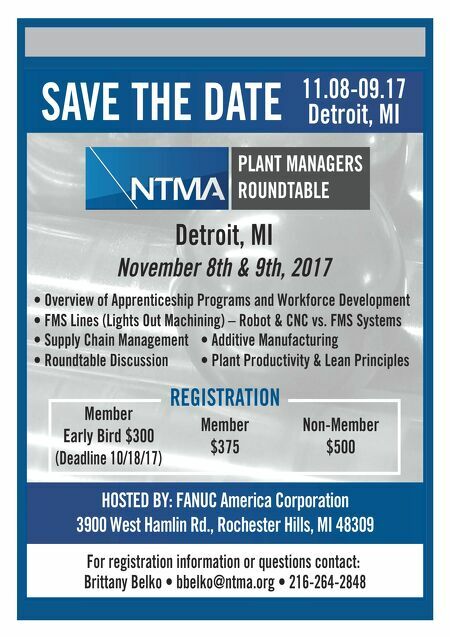 178 MMS November 2017 mmsonline.com MODERN EQUIPMENT REVIEW as controls that enable high productivity. Specifications include a spindle coolant system, an HSK–E40 spindle taper, a 29.52" × 23.62" table with an 881.84-lb load capacity and an automatic toolchanger with a 16-tool capacity. Hwacheon Machinery America Inc., call 847-573-0100 or visit hwacheon.com. CLEANERS, CORROSION PREVENTATIVES INCREASE PROCESS FLOW Milacron has added four cleaners to its Cimclean product line, as well as four new Cimguard cor- rosion preventatives. The easy-to-apply products a re de signe d to re duc e costs by incre asing process flow and reducing rejected parts, deliv- ering value with their low usage rates, gaging- friendly residues and multi-metal capability. Cimclean industrial cleaning products focus on high-pressure spray, immersion and mainte- nance. Four products have been added to the line, including SP-787, a gaging-friendly pressure- spray alkaline cleaner with foam and corrosion control and good sump life; IM-604, a versatile immersion, vibratory and ultrasonic cleaner that combines sump life with corrosion control and can also be applied by spray; MC-Multi Kleen, an economical general shop maintenance cleaner that can be used in mops, buckets and wipe- downs, as well as in walk-behind floor cleaners; and MC-30, a maintenance cleaner and disin- fectant for machine tool cleanouts in advance of a fresh charge of metalworking fluids. For corrosion preventatives, the Cimguard product line focuses on duration of protection, as well as indoor and outdoor storage. 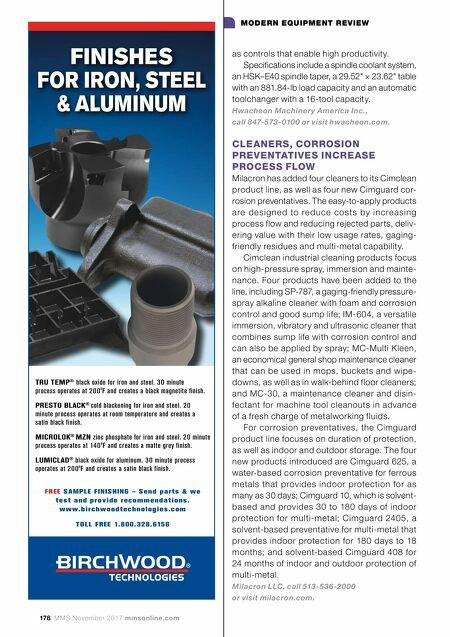 The four new products introduced are Cimguard 625, a water-based corrosion preventative for ferrous metals that provides indoor protection for as many as 30 days; Cimguard 10, which is solvent- based and provides 30 to 180 days of indoor protection for multi-metal; Cimguard 2405, a solvent-based preventative for multi-metal that provides indoor protection for 180 days to 18 months; and solvent-based Cimguard 408 for 24 months of indoor and outdoor protection of multi-metal. Milacron LLC, call 513-536-2000 or visit milacron.com. FINISHES FOR IRON, STEEL & ALUMINUM FREE SAMPLE FINISHING – Send parts & we test and provide recommendations. www.birchwoodtechnologies.com T OLL FREE 1.800.328.6156 TRU TEMP ® black oxide for iron and steel. 30 minute process operates at 200 o F and creates a black magnetite finish. PRESTO BLACK ® cold blackening for iron and steel. 20 minute process operates at room temperature and creates a satin black finish. MICROLOK ® MZN zinc phosphate for iron and steel. 20 minute process operates at 140 o F and creates a matte grey finish. LUMICLAD ® black oxide for aluminum. 30 minute process operates at 200 o F and creates a satin black finish.